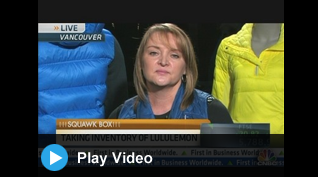 Christine Day was recently interviewed on CNBC about stocks and speculations about lululemon short selling recommendations, but more important to us consumers is the sneak peek we see of the new ‘What The Fluff‘ line that she boasted about during the Lululemon Q2 2012 Earnings Call. 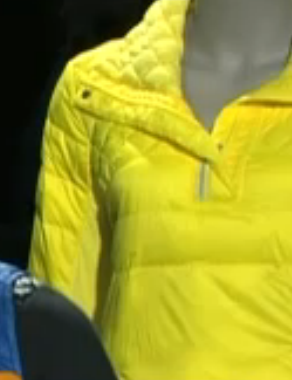 This is the new light weight down puffy run line, and Christine is wearing the vest along with a skirt (down skirt??). The top right is a pullover and from the video it looks matt, not satin but I could be wrong. I’m so far not interested in it based on the colors (is that Split Pea and Pigment Blue again? Or maybe it’s a true yellow). I didn’t get any of the puffy pullovers last year from the run line as it’s really too warm for Vancouver running. If I lived in Saskatoon and ran year round I may have been interested but they were quite pricey and I didn’t like the look of them for casual wear. On the left is the mens version of the lined called ‘Fluff Off‘. 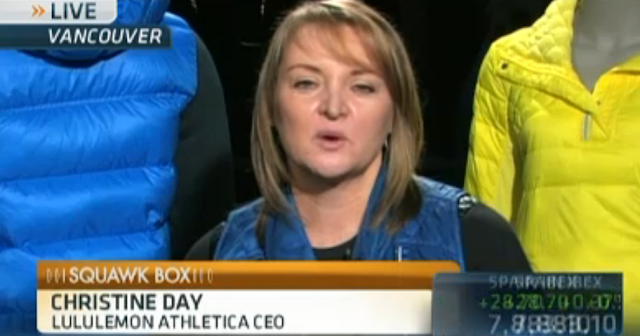 "Color Comparison: Flare, Creamsicle Pop, Pop Orange."